David Platt is the President of the International Mission Board of the Southern Baptist Convention. He is widely regarded as being a highly intelligent, deeply passionate, seriously committed follower of Christ whose credentials as a pastor and leader are unquestionable. 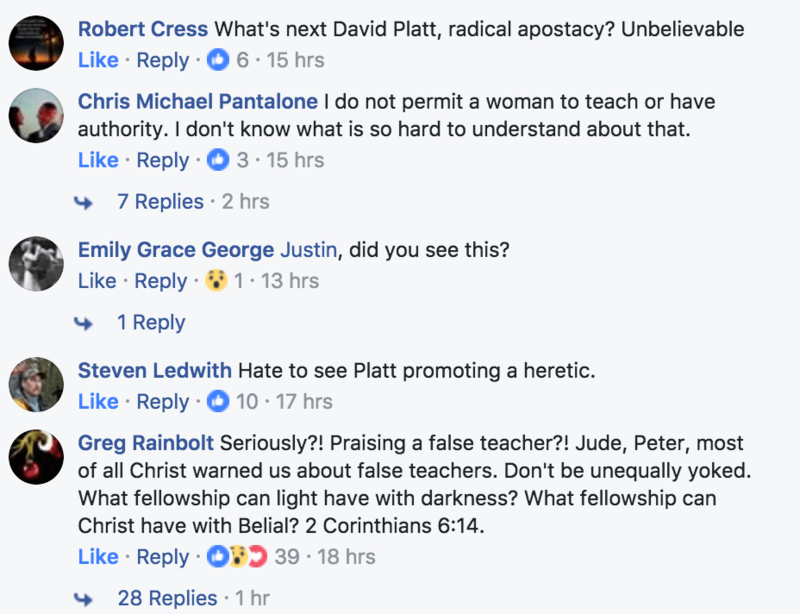 Indeed, David Platt seems to be one of the good guys. 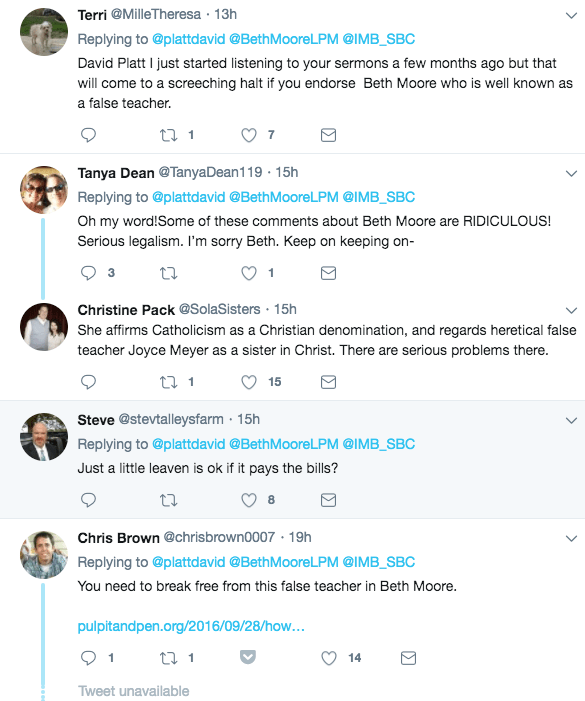 There are some problems with Platt in recent years, not the least of which was opening up Southern Baptist mission service to ecstatic tongue-speakers. While Platt was opening up Southern Baptist mission service to tongue-speaking babblers, he was forced to bring home roughly a thousand missionaries after the IMB lost hundreds of millions of dollars (210 million, in fact) due to epic mismanagement (the mismanagement happened before Platt’s tenure). Why Southern Baptist missionaries were told there wasn’t enough room for them at the IMB, he was simultaneously opening the door for those who believe God is speaking through their gibberish. Likewise, Platt has become increasingly charismatic (or his charismaticism has been increasingly observed) in recent years, believing and relaying all kinds of fanciful tales, including recalling an unsubstantiated resurrection account in Southeast Asia. He also re-told an old missionary fable about a man getting saved from reading the Bible page-by-page after using it to roll up cigarettes (the problem is Platt told this account as though he personally knew it for sure and it was recent, when in fact it’s a 140 year-old gypsy story). Platt also signed the asinine amicus brief to help get a Mosque built in New Jersey, but for that he thankfully (and commendably) apologized. In all of the above, Platt has been relatively immune to criticism. At least, until now. 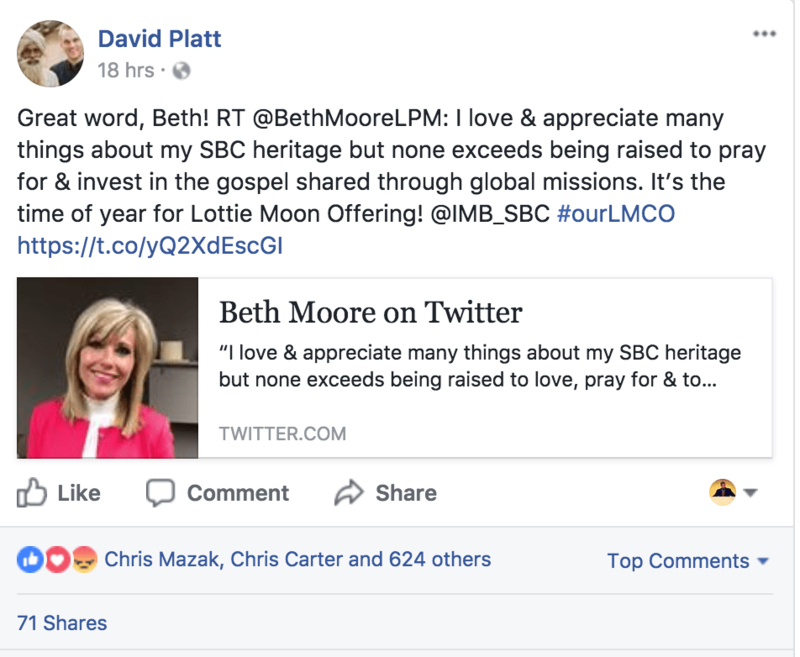 The Lottie Moon Christmas offering is being taken up to support the International Missions Board, and Beth Moore sent out a tweet commending the offering to her Twitter followers. Platt RT’d it. Beth Moore is still in financial business with the Southern Baptist Convention, as their publishing arm and retail chain, Lifeway Christian Resources, markets, publishes and promotes her material as the #1 seller. She knows on what side her bread is buttered. Platt then re-tweeted (Rt’d for those who don’t get it) Moore. Like striking a match to gasoline, Platt’s social media platforms blew up with shock and outrage that he would associate himself in any capacity with who has been widely discredited as a wild-eyed, crazy prophetess. This is a good thing. It’s not a bad thing. We would encourage you to try this exercise; consider this a challenge. 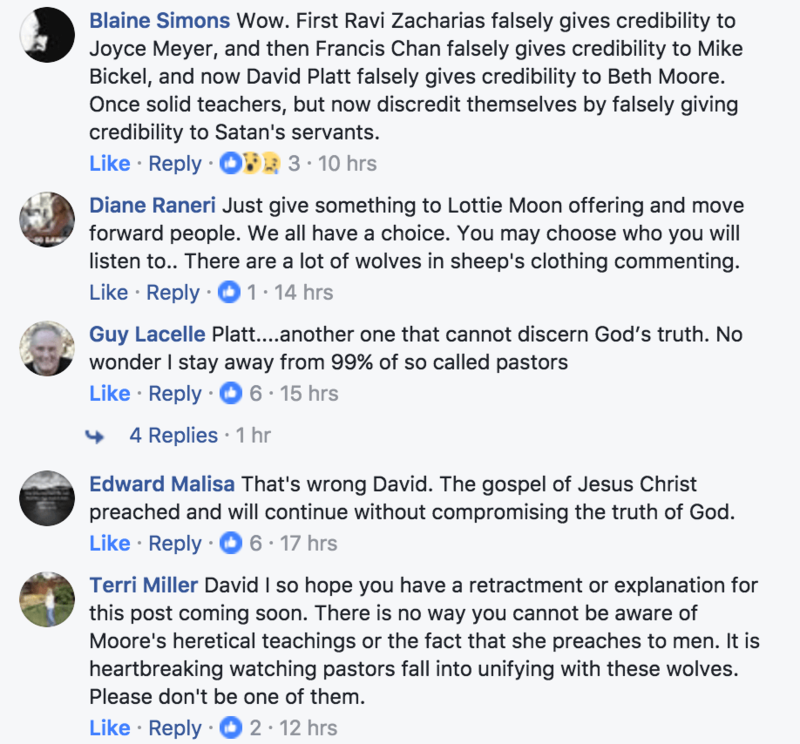 Find Platt’s Twitter or Facebook feed, find the women supporting Beth Moore, and look at their social media platforms (assuming they’re public). What you’ll find – without exception – is that these are women in need of serious spiritual intervention and a dire need for discipleship. 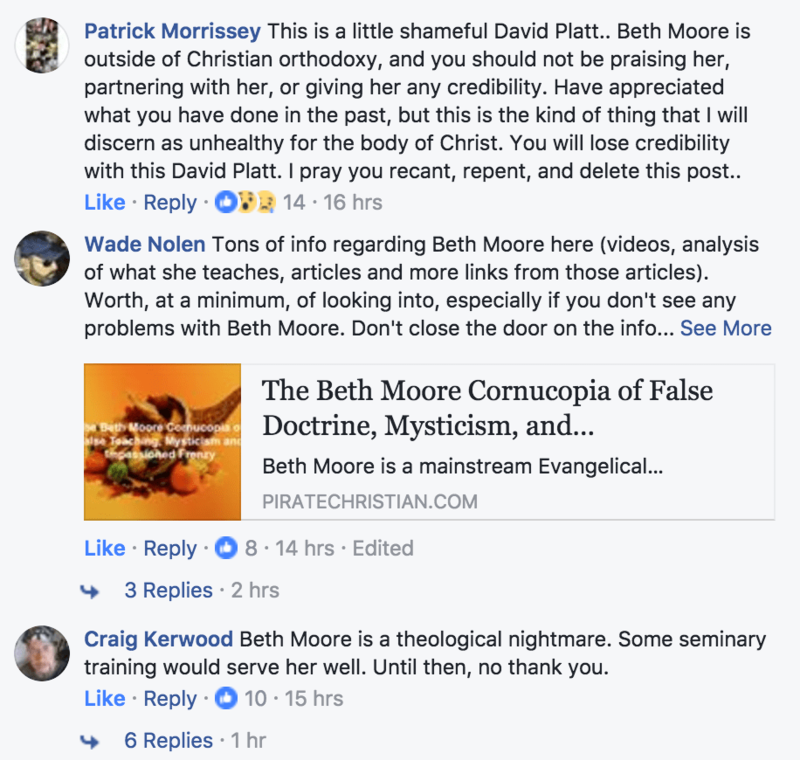 Beth Moore is dangerous to women and is dangerous to the Christian faith. She produces a Vacation Bible School-level doctrinal education, complete with bizarre visions and Word-Faith jargon, and thanks to the millions in financial partnership with Southern Baptist’s Lifeway, it is all passed off as the creme de la creme of female Bible instruction. In reality, her teaching produces the weak women taken captive in 2 Timothy 3:6. 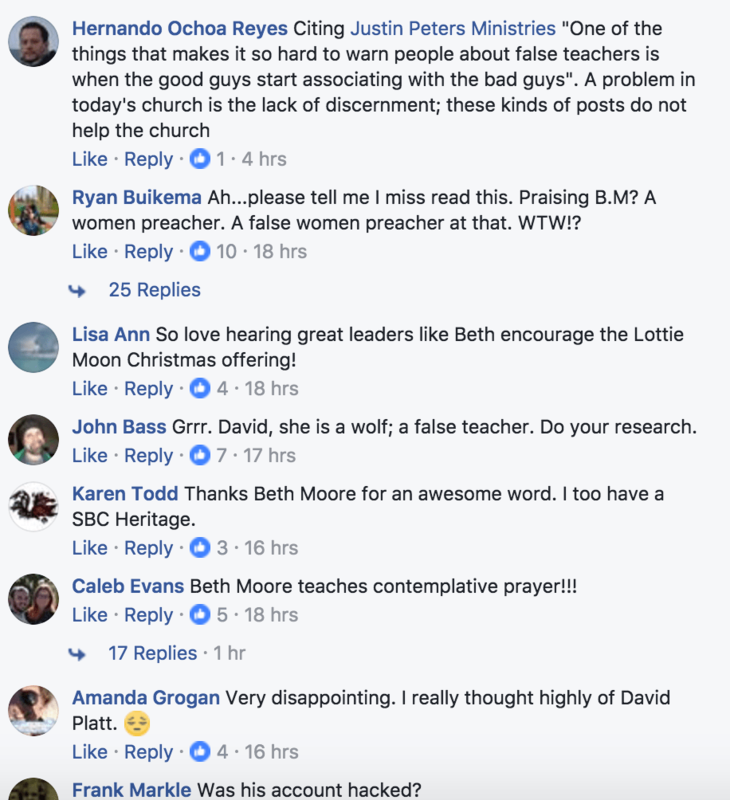 For millions of Southern Baptist women, in particular, Beth Moore has been the gateway drug to even more nefarious prophetesses like Christine Caine, Ann Voskamp, and Joyce Meyer (all of whom Beth Moore supports and endorses). 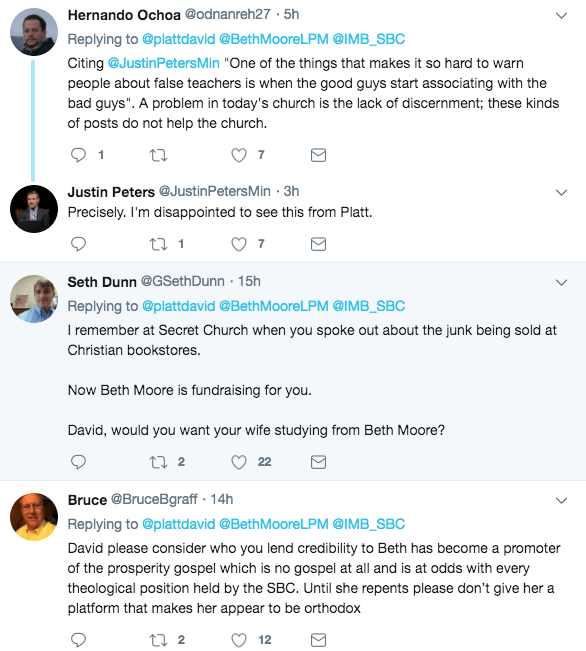 Now, some would argue that Platt wasn’t endorsing or promoting Beth Moore but a mere RT, but one must doubt that the prophet Amos would RT the Cows of Bashan. 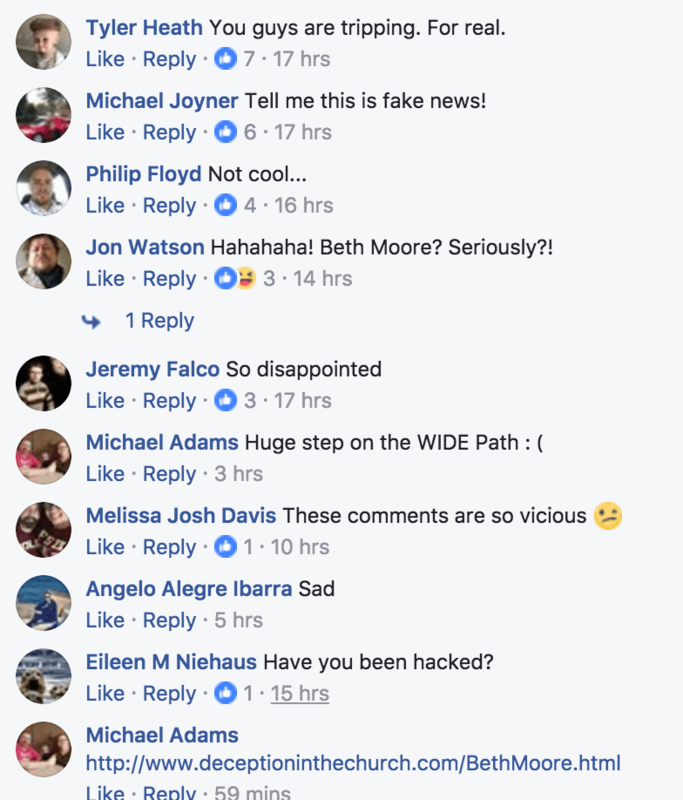 If financial support is the only rea$on Platt tweeted Moore and it was not an endor$ement of her, it make$ it even worse. 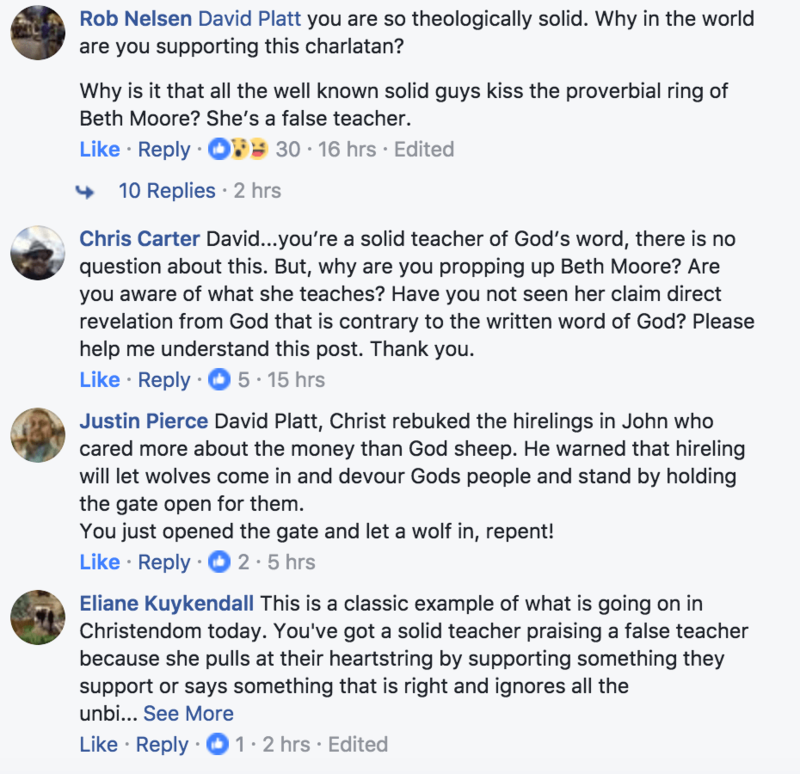 For more on why Beth Moore is not good for women, click here. In the mean time, if you want to know why you shouldn’t support the Cooperative Program or the Southern Baptist Convention because it’s bad financial stewardship, read this free book here. We pray that you will find missionaries you know and trust, and support them personally this Christmas. Does God Love All Men? Previous story Is Discernment Biblical? These 14 Minutes May Change Your View.